>Today’s New Band – Friska Viljor PLUS! "It’s BAWWWSS TAAAIIIIME!" Someone sent me a link to the half-time entertainment from the Super Bowl. My knowledge of American Football began and ended in a bar in Haight in San Fransisco, where I watched a game whilst the myriad rules were explained to me by increasingly exasperated friends. Even though it seemed that my knowledge of the game decreased exponentially the more was explained to me, I enjoyed watching the nylon blur of colours trying to cripple each other. This particular video began with an announcement – “It’s Boston!” which immediately caused an involuntary keyboard-stabbing recoil, in fear of the upcoming MOR onslaught. After a few seconds, it dawned that “Boss Time!” had actually been announced, and so I settled back to enjoy some only slightly less MOR rock. Bruce Springsteen has an influence on modern rock that I suspect comes from many bands’ too-intimate childhood knowledge of parents’ record collections. Bands have learnt to drop in epic power chord choruses willy-nilly, and the result, ultimately, has been The Killers. The Boss has also become a nice easy comparison for music reviewers to sling at any band with a big, lush rawk tune in its armoury. Reviews of the last, hugely overblown Arcade Fire album were particularly guilty of this. 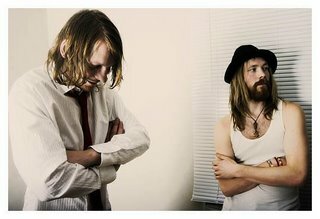 If there is a bit of The Boss in Today’s New Band, Friska Viljor, he’s hiding, or at least exploring a newly cute side. Shuddering inevitability out of the way first: they’re from Sweden, and so are typically tuneful, upbeat and unpretentious. Their songs are joyous, gentle and poppy – the antidote to almost all current rock music. Songs like Arpeggio are so simple, kind and happy that only a determinedly awful person would not feel toes involuntarily twitching to the twittering beat. Choruses soar sweetly, without bloating or preening. Old Man is almost Ska-Pop, but not quite; this in itself is its saving grace – and its chorus rockets into the clouds, mindless and gleeful. Early Morning changes again, slickly rocking with stabbing guitar and metronomic drums, and then Gold grabs a big, loony, falsetto chorus from the Chorus Gods and shoves it at you madly. Friska Viljor are rock magpies, nibbling this sound and that riff and producing music that flip-slops whichever way they fancy. Maybe calling their sound a musicial Smörgåsbord would be one glib Swedish reference too far, but damn it, it fits perfectly. Get your fill here! Posted on February 16, 2009 by Joe Sparrow. This entry was posted in Today's New Band and tagged happy happy joy joy, Sweden, wandering minds. Bookmark the permalink. ← >Today’s New Band – Drumcorps PLUS! Rolf Harris!